Oh man, we are in that tricky time of year! My mind is telling me that it should be Fall - back to school shopping, new notebooks, sharpened pencils, shorter days, pretty new clothes all hung up in the stores. But the weather is telling me otherwise! So how do I fight the end of Summer funk & sale vortex? By adding items to my wardrobe that can be worn now while Summer is still here & later when the leaves begin to fall & the temps start to dip. Boutique Onze sent over this fun knit day dress & I couldn't help but throw it on for a comfy weekend look & dream up 2 ways I will be wearing it in a little bit & much later. What pieces in your wardrobe are doing overtime to keep the end of Summer funk away? I am a big fan of transitional pieces and this dress is definitely perfect for the warm weather you're having and on to the cooler months! Love this dress!! You showed great versatility with it. Such a great staple for a closet. This is amazing–I'm really bad at transitioning pieces, so it was great to see this mixed up in so many different ways. I l-o-v-e the last look, and your hair in the first is super cute! way cute! love the later fall look! This is such a perfect piece to carry you through the next couple months! 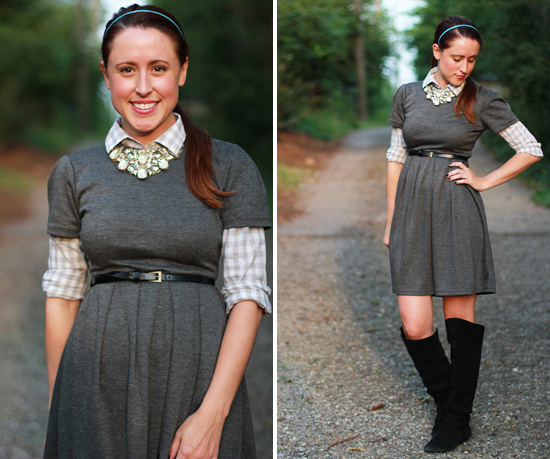 I can't wait to start layering my dresses for cooler temps! 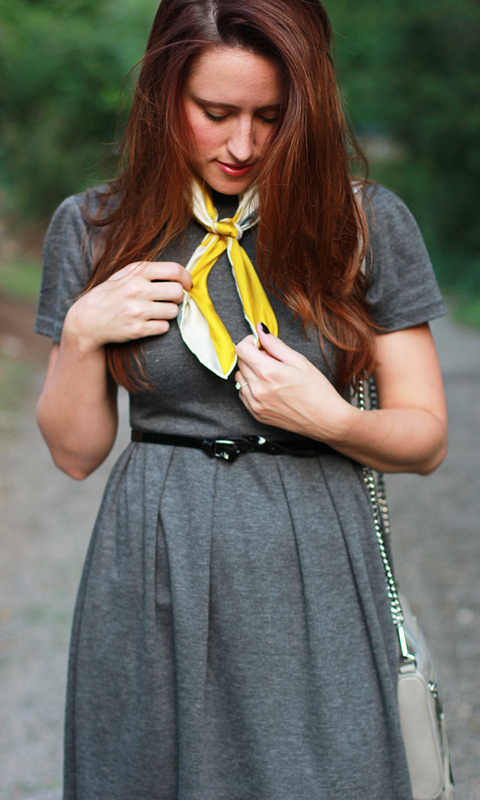 I love styling and re-styling a dress like this! 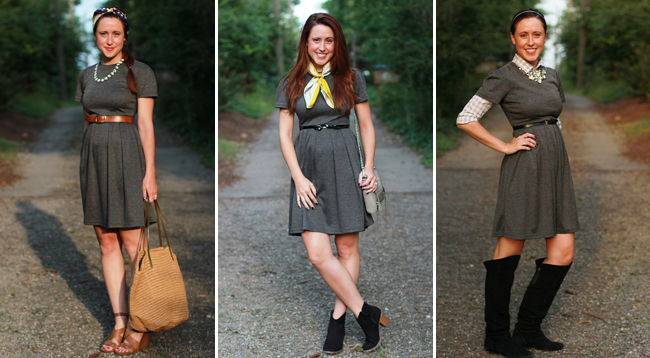 Great options to make the dress go into Fall! It really is a tricky part of the year. It's so muggy and hot in Louisville. Although I'm happy summer isn't over just yet, I'm kind of getting sick of the 90 degree weather. The way you styled the outfits are gorgeous! What a cute post! I usually don't love layering, but your last look is super cute! Seriously how cute are you!? Love all 3 ways you wore it. Such a cute dress and I love how you can transition it so easily! I love pieces that can be worn year-round! You will get so much wear out of this versatile dress! I love how you styled this dress multiple ways! They all look super cute! I really love all three looks, and you hair looks great! So so pretty! All the looks are amazing :) Great dress! Such a versatile dress! 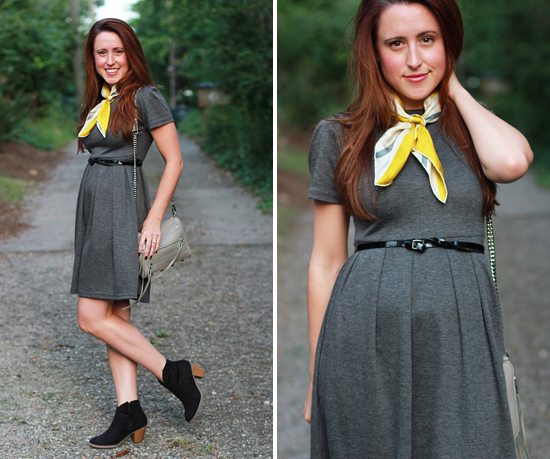 I love each way you styled it! Perfect for this transitional time! I love that you were able to style this dress for the tricky season we're in here in the South. I'm so excited for Fall but it's so hard to be festive in this sticky heat! I love all three of these looks! What a great dress! That is a really good idea! I wouldn't have thought of that. I have a dress kinda like that so this is great inspiration. You are so cute in all of these! Seriously, all these looks are adorable! I can't even pick a favorite. Maybe the fall one since I love a good layered look. Makes outfits just that much more interesting. Love! This is a great dress, and so versatile for the coming months! That dress looks alot like Madewell's sweatshirt dress, which I own, and I'll definitely be filinng away these styling ideas! I love how you were able to transition all these pieces! I just couldn't fight the urge anymore and completed my spring/summer to fall/winter wardrobe closet transition today. The only problem? Tomorrow is supposed to be the hottest day of the year here in Chicago. So that should be fun. Love the idea behind this post - and I totally appreciate the ideas!! Great versatile dress! I love the color and it looks so comfy. Bring on the cooler weather! Agreed! July was so mild here that I got spoiled, & then WHAM August came it was all horribly humid Summer! I'm taking up wearing my Fall clothes around the house just to appease my itch! Thank you lady! I hope you come back to Nashville real soon so we can hang out! You and me both girlie! It was 90 ˚F when I took these photos, so this was the only layering I could muster, but in a month or two I am definitely adding some tights and cardigans! Ugh, I know! I am trying to hold off on the full switch, but I can't help but wear my shorter booties already! Sorry, I'm not sorry! great versatile dress and lovely outfits!